Apologies for the quality of the photos. It was dark in there and I didn’t want to use my flash. We wanted to save a steakhouse for our last night in Dallas. I was looking forward to it for so long. If you’ve read my reviews of restaurants in Dallas during the trip, you will find that my friend and I generally thought the food was outstanding. Even when it wasn’t great, we were still able to find something that made the meal worthy. That is somewhat the case here at Hoffbrau Steaks, although we left very disappointed. I don’t want to bash the place, because the service was incredibly friendly and the drinks/appetizers were also great. However, my meal was very average and his was pretty much inedible. I’ll start with the bad so we can end on a good note. I ordered the 10 oz sirloin (pictured above), figuring it would be great since we were in Texas. Now, I have noticed a trend in New Jersey that most places are afraid to give you a steak rare even if that is what you order. I assumed Texas, the land of beef and cattle, would fulfill my request of a rare, bleeding steak. Nope. It came medium, still edible and not horrific, but not what I asked for. I very rarely send food back, and did not here either, but I was kind of peeved that they messed such a little thing up. It was a good-sized portion for the $17 price, coming with obviously instant mashed potatoes and gravy (neither of which had any flavor), a decent dinner salad, and a basket of warm rolls. Had I gotten this meal in New Jersey, I would have said, “Par for the course”, but given where we were, I wasn’t a fan. His dinner is where we encountered the real problem. 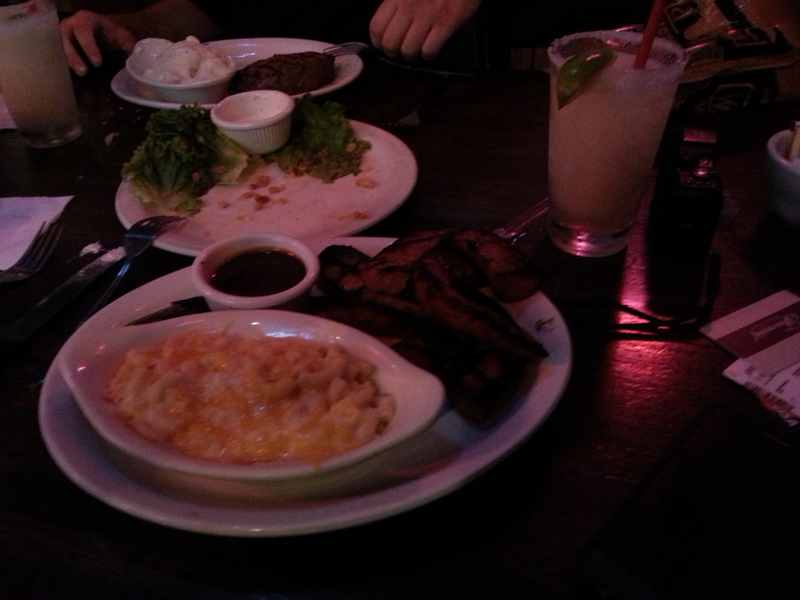 He got the grilled smoked sausage (cooked in a Dr. Pepper BBQ sauce) that came served with macaroni and cheese and a side salad. At first glance, the sausage appeared a little “well-done”, but when he bit into it I could tell there was something wrong. I tried a piece myself, and it was literally burnt to a crisp. So over-cooked that it was impossible to eat. In addition to that, the mac n’cheese was downright disgusting. When scooping it up with the fork, it was almost like soup, the milky cheese sauce spilling into the plate. When the waitress came over to check on us, even she noticed that his meal had been screwed up. She immediately offered to replace it with anything else, but at that point, he just wanted her to take it back and remove it from the bill, which she did without issue. Prior to our meals, I will say that the drinks and appetizers were fantastic. We slipped in before 7 pm, so their Happy Hour was still on, meaning half-priced appetizers and $4 margaritas. We got the candied bacon, an order of fried pickles, and margaritas—of course. 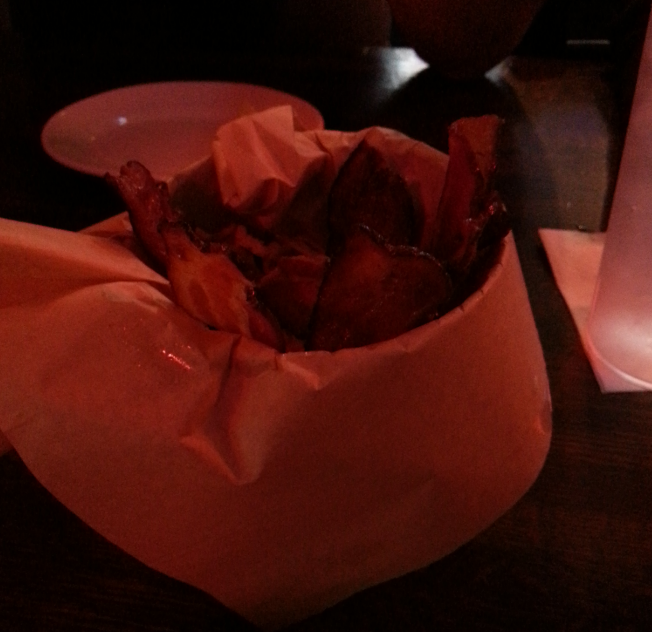 The description for the bacon on the menu was a little misleading, noting you would receive “eight” pieces. However, it really was only four slices cut in half, meaning yes, eight pieces. I was just irked by this. They tasted good and came served standing up in a metal bucket and topped with onion straws. If you look at the picture of this app outside their restaurant window, it is shown in such a way that you think you are getting eight slices. But, for the $5.75 price ($2.80 after the discount), we could not really complain. 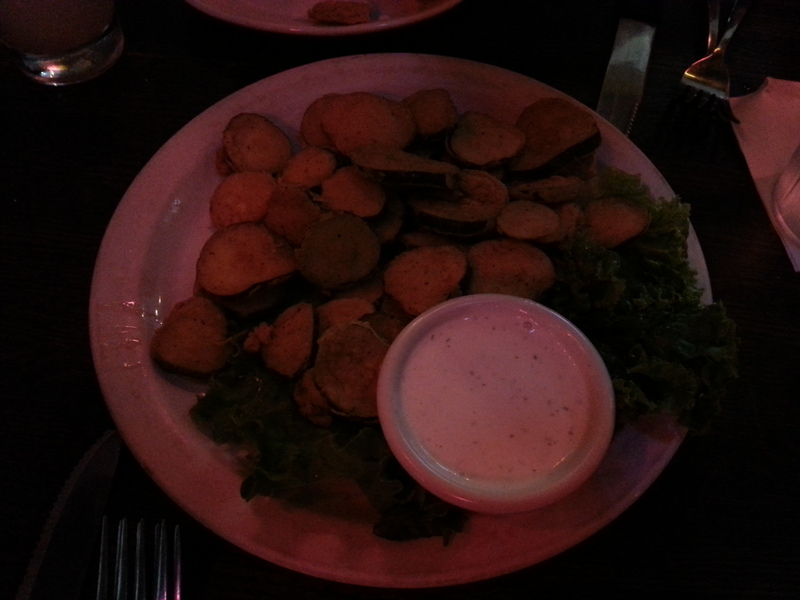 The fried pickles also happened to be good, sliced very thin and not covered in a lot of breading. They were fried just right, and came with a side of ranch dressing. I want to mention the waitress again. She was so pleasant, and at around 6:55, came over to the table and asked if we wanted her to put in another round of margaritas so that we would still get the Happy Hour price. It was a considerate suggestion, and we thanked her for thinking of it. The margaritas were pretty strong and had good flavor; not too limey like at various times previously in the trip. Only a mild pucker. Overall, I wanted so badly to like this place, but in the end, could not give it any higher than a 3 out of 5 stars. Based on entrees alone, it would have been a 2 or a 2.5, but because of everything else, it rises slightly. We probably would not return, except for maybe a late afternoon drink and a snack. This post was originally published here. Hoffbrau Steaks is located at 311 North Market Street in Dallas, Texas.